A stag whose antlers and head became entangled in discarded wire had to be put to sleep after damaging its throat, the RSPCA has said. The fallow deer stag was spotted by a welfare officer in Tintern, Monmouthshire, on Saturday but she and a colleague were unable to catch it. 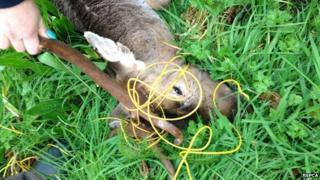 The animal remained in a field over the weekend until a vet managed to sedate it with a dart. The vet found its voicebox had become detached, and had to euthanise it. Animal welfare officer Sian Burton believed the wire might have been on the stag for some time. "There were some wounds under his jaw which were healing which could have been caused by the wire," she said. "We just urge people to dispose of their rubbish responsibly and for people to contact us if they spot an animal in distress."